Not to be confused with Soviet–Japanese War. Russia sought a warm-water port on the Pacific Ocean for its navy and for maritime trade. Vladivostok was operational only during the summer, whereas Port Arthur, a naval base in Liaodong Province leased to Russia by China, was operational all year. 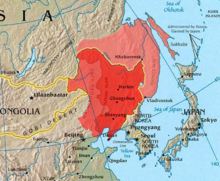 Since the end of the First Sino-Japanese War in 1895, Japan feared Russian encroachment on its plans to create a sphere of influence in Korea and Manchuria. Russia had demonstrated an expansionist policy in the Siberian Far East from the reign of Ivan the Terrible in the 16th century. 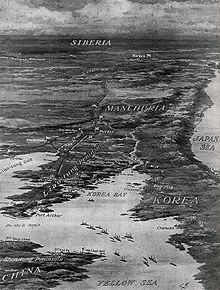 Seeing Russia as a rival, Japan offered to recognize Russian dominance in Manchuria in exchange for recognition of Korea as being within the Japanese sphere of influence. Russia refused and demanded Korea north of the 39th parallel to be a neutral buffer zone between Russia and Japan. The Japanese government perceived a Russian threat to its plans for expansion into Asia and chose to go to war. 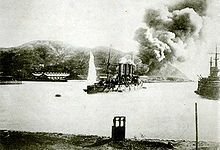 After negotiations broke down in 1904, the Japanese Navy opened hostilities by attacking the Russian Eastern Fleet at Port Arthur, China, in a surprise attack. 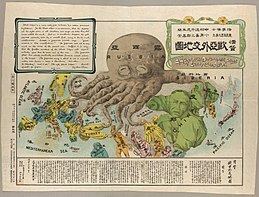 An anti-Russian satirical map produced by a Japanese student at Keio University during the Russo-Japanese War. It follows the design used for a similar map first published in 1877. After the Meiji Restoration in 1868, the Meiji government endeavored to assimilate Western ideas, technological advances and ways of warfare. By the late 19th century, Japan had transformed itself into a modernized industrial state. The Japanese wanted to be recognized as equal with the Western powers. The Meiji Restoration had been intended to make Japan a modernized state, not a Westernized one, and Japan was an imperialist power, looking towards overseas expansionism. In the years 1869–73, the Seikanron ("Conquer Korea Argument") had bitterly divided the Japanese elite between one faction that wanted to conquer Korea immediately vs. another that wanted to wait until Japan was more modernized before embarking on a war to conquer Korea; significantly no-one in the Japanese elite ever accepted the idea that the Koreans had the right to be independent, with only the question of timing dividing the two factions. Even worse, the Western Powers were conquering small pieces of China and China had dominated Korea with its military for centuries. The Japanese were doing what they could to emulate the West in every way possible, including conquering and occupying its neighbors. 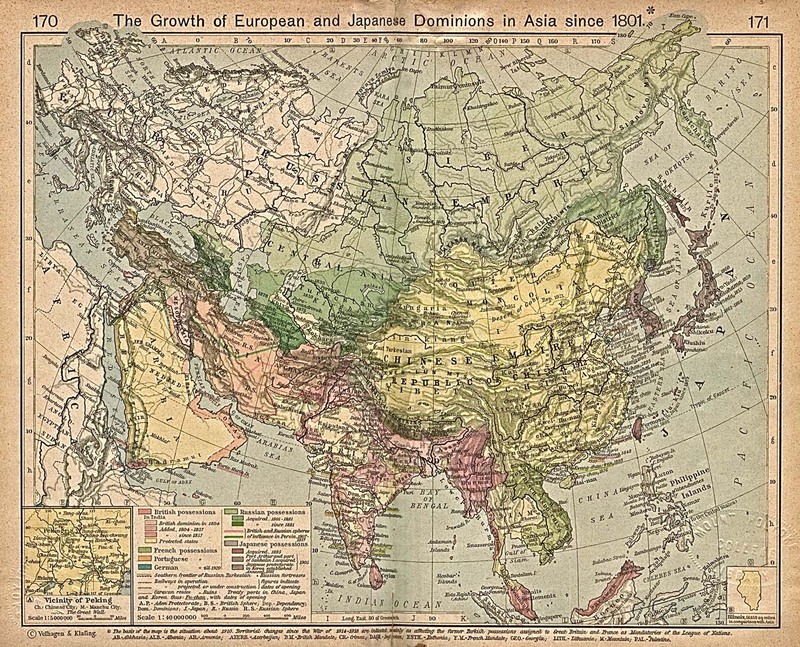 In much the same way that Europeans used the "backwardness" of African and Asian nations as a reason for why they had to conquer them, for the Japanese elite the "backwardness" of China and Korea was proof of the inferiority of those nations, thus giving the Japanese the "right" to conquer them. Inouye Kaoru, the Foreign Minister, gave a speech in 1887 saying "What we must do is to transform our empire and our people, make the empire like the countries of Europe and our people like the peoples of Europe", going to say that the Chinese and Koreans had essentially forfeited their right to be independent by not modernizing. Much of the pressure for an aggressive foreign policy in Japan came from below, with the advocates of "people's rights" movement calling for an elected parliament also favoring an ultra-nationalist line that took it for granted the Japanese had the "right" to annex Korea, as the "people's right" movement was led by those who favored invading Korea in the years 1869–73. As part of the modernization process in Japan, Social Darwinian ideas about the "survival of the fittest" were common in Japan from the 1880s onward and many ordinary Japanese resented the heavy taxes imposed by the government to modernize Japan, demanding something tangible like an overseas colony as a reward for their sacrifices. Furthermore, the educational system of Meiji Japan was meant to train the schoolboys to be soldiers when they grew up, and as such, Japanese schools indoctrinated their students into Bushidō ("the spirit of the warriors"), the fierce code of the samurai. Having indoctrinated the younger generations into Bushidō, the Meiji elite found themselves faced with a people who clamored for war, and regarded diplomacy as a weakness. The British Japanologist Richard Storry wrote the biggest misconception about Japan in the West was that the Japanese people were the "docile" instruments of the elite, when in fact much of the pressure for Japan's wars from 1894 to 1941 came from below, as ordinary people demanded a "tough" foreign policy, and tended to engage in riots and assassination when foreign policy was perceived to be pusillanimous. 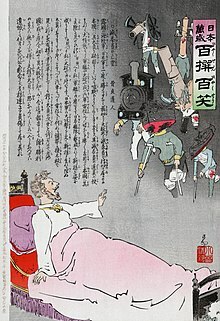 Though the Meiji oligarchy refused to allow democracy, they did seek to appropriate some of the demands of the "people's rights" movement by allowing an elected Diet in 1890 (with limited powers and an equally limited franchise) and by pursuing an aggressive foreign policy towards Korea. The Japanese statesman Itō Hirobumi started to negotiate with the Russians. He regarded Japan as too weak to evict the Russians militarily, so he proposed giving Russia control over Manchuria in exchange for Japanese control of northern Korea. Of the five Genrō (elder statesmen) who made up the Meiji oligarchy, Itō Hirobumi and Count Inoue Kaoru were opposed to war against Russia on financial grounds while Katsura Tarō, Komura Jutarō and Field Marshal Yamagata Aritomo favored war. Meanwhile, Japan and Britain had signed the Anglo-Japanese Alliance in 1902, the British seeking to restrict naval competition by keeping the Russian Pacific seaports of Vladivostok and Port Arthur from their full use. The alliance with the British meant, in part, that if any nation allied itself with Russia during any war against Japan, then Britain would enter the war on Japan's side. Russia could no longer count on receiving help from either Germany or France without there being a danger of British involvement in the war. With such an alliance, Japan felt free to commence hostilities, if necessary. Wilhelm aggressively encouraged Russia's ambitions in Asia as France, Russia's ally since 1894, was less than supportive of Russian expansionism in Asia, and it was believed in Berlin that German support of Russia might break up the Franco-Russian alliance and lead to a new German–Russian alliance. The French, who had been Russia's closest allies since 1894, made it clear that they disapproved of Nicholas's forward policy in Asia with the French Premier Maurice Rouvier publicly declaring that the Franco-Russian alliance applied only to Europe, not Asia, and that France would remain neutral if Japan attacked Russia. 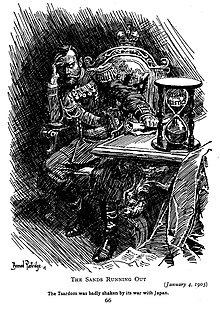 The American president Theodore Roosevelt, who was attempting to mediate the Russian–Japanese dispute, complained that Wilhelm's "Yellow Peril" propaganda, which strongly implied that Germany might go to war against Japan in support of Russia, encouraged Russian intransigence. On 24 July 1905, in a letter to the British diplomat Cecil Spring Rice, Roosevelt wrote that Wilhelm bore partial responsibility for the war as "he has done all he could to bring it about", charging that Wilhelm's constant warnings about the "Yellow Peril" had made the Russians uninterested in compromise as Nicholas believed that Germany would intervene if Japan attacked. The implicit promise of German support suggested by Wilhelm's "Yellow Peril" speeches and letters to Nicholas led many decision-makers in St. Petersburg to believe that Russia's military weaknesses in the Far East like the uncompleted Trans-Siberian railroad line did not matter as it was assumed the Reich would come to Russia's assistance if war should come. In fact, neither Wilhelm nor his Chancellor Prince Bernhard von Bülow had much interest in East Asia, and Wilhelm's letters to Nicholas praising him as Europe's savior against the "Yellow Peril" were really meant to change the balance of power in Europe as Wilhelm believed that if Russia was embroiled with Japan, this would break up the Franco-Russian alliance and lead to Nicholas signing an alliance with Germany. This was especially the case as Germany had embarked upon the Tirpitz plan and a policy of Weltpolitik meant to challenge Britain's position as the world's leading power, and since Britain was allied to Japan, then if Russia and Japan could be manipulated into going to war with each other, that this in turn would lead to Russia turning towards Germany. Furthermore, Wilhelm believed if a Russian–German alliance emerged, France would be compelled to join it and having Russia pursue an expansionist policy in Asia would keep Russia out of the Balkans, thus removing the main source of tension between Russia and Germany's ally Austria-Hungary. During the war, Nicholas who took at face value Wilhelm's "Yellow Peril" speeches, placed much hope in German intervention on his side, and more than once, Nicholas chose to continue the war out of the belief that the Kaiser would come to his aid. During the Russian–Japanese talks, the Japanese historian Hirono Yoshihiko noted that "once negotiations commenced between Japan and Russia, Russia scaled back its demands and claims regarding Korea bit by bit, making a series of concessions that Japan regarded as serious compromises on Russia's part". The war might have been avoided had not the issues of Korea and Manchuria become linked. The Korean and Manchurian issues had become linked as the Prime Minister Katsura Tarō decided if war did come, that Japan was more likely to have the support of the United States and Great Britain if the war could be presented as a struggle for free trade against the highly protectionist Russian empire, in which case, Manchuria, which was the larger market than Korea, was more likely to engage Anglo-American sympathies. Throughout the war, a recurring theme of Japanese propaganda was Japan was a "civilized" power that supported free trade and would implicitly allow foreign businesses into the resource-rich region of Manchuria vs. Russia the "uncivilized" power that was protectionist and wanted to keep the riches of Manchuria all to itself. Even before the war, British and Japanese intelligence had co-operated against Russia due to the Anglo-Japanese Alliance. During the war, Indian Army stations in Malaya and China often intercepted and read wireless and telegraph cable traffic relating to the war, which was shared with the Japanese. In their turn, the Japanese shared information about Russia with the British with one British official writing of the "perfect quality" of Japanese intelligence. In particular, British and Japanese intelligence gathered much evidence that Germany was supporting Russia in the war as part of a bid to disturb the balance of power in Europe, which led to British officials increasingly perceiving that country as a threat to the international order. Meanwhile, the Russians were preparing to reinforce their Far East Fleet by sending the Baltic Fleet, under the command of Admiral Zinovy Rozhestvensky. After a false start caused by engine problems and other mishaps, the squadron finally departed on 15 October 1904, and sailed halfway around the world from the Baltic Sea to the Pacific via the Cape Route around the Cape of Good Hope in the course of a seven-month odyssey that was to attract worldwide attention. The Dogger Bank incident on 21 October 1904, where the Russian fleet fired on British fishing boats that they mistook for enemy torpedo boats, nearly sparked a war with the United Kingdom (an ally of Japan, but neutral, unless provoked). During the voyage, the fleet separated into a portion that went through the Suez Canal while the larger battleships went around the Cape of Good Hope. Sources do not agree on a precise number of deaths from the war because of a lack of body counts for confirmation. The number of Japanese Army dead in combat or died of wounds is put at around 59,000 with around 27,000 additional casualties from disease, and between 6,000 and 12,000 wounded. Estimates of Russian Army dead range from around 34,000 to around 53,000 men with a further 9,000–19,000 dying of disease and around 75,000 captured. The total number of dead for both sides is generally stated as around 130,000 to 170,000. China suffered 20,000 civilian deaths, and financially the loss amounted to over 69 million taels' worth of silver. The effects and impact of the Russo-Japanese War introduced a number of characteristics that came to define 20th-century politics and warfare. Many of the technological innovations brought on by the Industrial Revolution first became present on the battlefield in the Russo-Japanese War. Weapons and armaments were more technological than ever before. Technological developments of modern armaments, such as rapid-firing artillery and machine guns, as well as more accurate carbine rifles, were first used on a mass scale in the Russo-Japanese War. The improved capability of naval forces was also demonstrated. Military operations on both sea and land demonstrated that warfare in a new age of technology had undergone a considerable change since the Franco-Prussian War of 1870–71. Most army commanders had previously envisioned using these weapon systems to dominate the battlefield on an operational and tactical level but, as events played out, these technological advancements forever altered the capacity in which mankind would wage war. For East Asia it was the first confrontation after thirty years involving two modern armed forces. Debate with respect to the Russo-Japanese War preluding World War II is a topic of interest to scholars today. Arguments that are favorable toward this perspective consider characteristics specific to the Russo-Japanese War to the qualities definitive of "total war". Numerous aspects of total war characterize the Russo-Japanese War. Encompassed on both ends was the mass mobilization of troops into battle. For both Russia and Japan, the war required extensive economic support in the form of production of equipment, armaments, and supplies at such a scale that both domestic support and foreign aid were required. 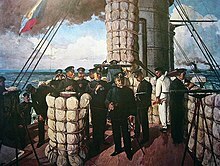 The conclusion of the Russo-Japanese War also demonstrated the need for world leaders to regard domestic response to foreign policy, which is argued by some scholars as setting in motion the dissolution of the Romanov dynasty by demonstrating the inefficiencies of tsarist Russia's government. 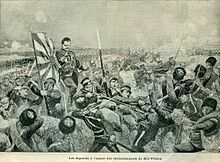 The Japanese were on the offensive for most of the war and used massed infantry assaults against defensive positions, which would later become the standard of all European armies during World War I. 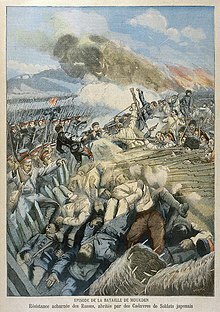 The battles of the Russo-Japanese War, in which machine guns and artillery took a heavy toll on Russian and Japanese troops, were a precursor to the trench warfare of World War I. A German military advisor sent to Japan, Jakob Meckel, had a tremendous impact on the development of the Japanese military training, tactics, strategy, and organization. His reforms were credited with Japan's overwhelming victory over China in the First Sino-Japanese War of 1894–1895. However, his over-reliance on infantry in offensive campaigns also led to a large number of Japanese casualties. Military and economic exhaustion affected both countries. Japanese historians regard this war as a turning point for Japan, and a key to understanding the reasons why Japan may have failed militarily and politically later. After the war, acrimony was felt at every level of Japanese society and it became the consensus within Japan that their nation had been treated as the defeated power during the peace conference. As time went on, this feeling, coupled with the sense of "arrogance" at becoming a Great Power, grew and added to growing Japanese hostility towards the West, and fueled Japan's military and imperial ambitions. Furthermore, Japan's substantiated interests in Korea and Liaodong led to the creation of a Kwantung Army, which became an autonomous and increasingly powerful regional force. Only five years after the war, Japan de jure annexed Korea as part of its colonial empire. Two decades after that, the Kwantung Army staged an incident that led to the invasion of Manchuria in the Mukden Incident; the Kwantung Army eventually came to be heavily involved in the state's politics and administration, leading to a series of localized conflicts with Chinese regional warlords that finally extended into total war between China and Japan in 1937. As a result, most Chinese historians consider the Russo-Japanese War as a key development in Japan's spiral into militarism in the 1920s–30s. Two others grew out of incidents during the war. "On the Hills of Manchuria" (Na sopkah Manchzhurii; 1906) is another waltz composed by Ilya Shatrov, a decorated military musician whose regiment suffered badly in the Battle of Mukden. Originally only the music was published, and the words by Stepan Petrov were added later. The second song, Variag, commemorates the Battle of Chemulpo Bay in which that cruiser and the gunboat Korietz steamed out to confront an encircling Japanese squadron rather than surrender. 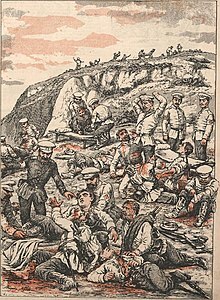 That act of heroism was first celebrated in a German song by Rudolf Greintz in 1907, which was quickly translated into Russian and sung to a martial accompaniment. These lyrics mourned the fallen lying in their graves and threatened revenge. Various aspects of the war were also common in contemporary children's fiction. Categorised as Boys' Own adventure stories, they offer few insights into the conflict, being generally based on news articles and sharing unreflectingly in the contemporary culture of imperialism. Among these, Herbert Strang was responsible for two novels: Kobo told from the Japanese side, and Brown of Moukden viewed from the Russian side. Three more were written by the prolific American author, Edward Stratemeyer: Under the Mikado's Flag, At the Fall of Port Arthur, and Under Togo for Japan, or Three Young Americans on Land and Sea (1906). Two other English-language stories begin with the action at Port Arthur and follow the events thereafter: A Soldier of Japan: a tale of the Russo-Japanese War by Captain Frederick Sadleir Brereton, and The North Pacific by Willis Boyd Allen (1855–1938). Two more also involve young men fighting in the Japanese navy: Americans in For the Mikado by Kirk Munroe, and a temporarily disgraced English officer in Under the Ensign of the Rising Sun by Harry Collingwood, the pen-name of William Joseph Cosens Lancaster (1851–1922), whose speciality was naval fiction. Another literary genre affected by the outcome of the war was invasion literature, either fuelled by racialist fears or generated by the international power struggle. 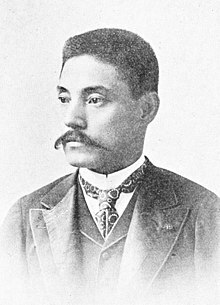 Shunrō Oshikawa's novel The Submarine Battleship (Kaitei Gunkan) was published in 1900 before the actual fighting began but shared the imperial tensions that produced it. It is the story of an armoured ram-armed submarine involved in a Russo-Japanese conflict. Three other novels appeared in 1908 and are thought of as significant now because of their prophetic dimension. American author Arthur Wellesley Kipling (1885–1947) prefaced his The New Dominion – A Tale of Tomorrow's Wars with a note counselling future vigilance. The scenario there is an attack by German and Japanese allies which the US and British navies victoriously fend off. In Germany itself an air attack on the American fleet is described by Ferdinand Heinrich Grautoff (1871-1935), writing under the name Parabellum, in his novel Banzai!. Published in Berlin in 1908, it was translated into English the following year. An Australian author using the pseudonym Charles H. Kirmess first serialised his The Commonwealth Crisis and then revised it for book publication as The Australian Crisis in 1909. It is set in 1912 and told from the standpoint of 1922, following a military invasion of Australia's Northern Territory and colonisation by Japanese settlers. Later there appeared a first-hand account of the siege of Port Arthur by Alexander Stepanov (1892–1965). He had been present there as the 12-year-old son of a battery commander and his novel, Port Arthur: a historical narrative (1944), is based on his own diaries and his father's notes. The work is considered one of the best historical novels of the Soviet period. A later novel in which the war appears is Valentin Pikul's The Three Ages of Okini-San (1981). Centred on the life of Vladimir Kokovtsov, who rose through the ranks to admiral of the Russian fleet, it covers the period from the Russo-Japanese War through to the February and October Revolutions. A much later Russian genre novel uses the period of the war as background. This is Boris Akunin's The Diamond Chariot (2003), in the first part of which the detective Erast Fandorin is charged with protecting the Trans-Siberian Railway from Japanese sabotage. The main historical novel dealing with the war from the Japanese side is Shiba Ryōtarō's Clouds Above the Hill, published serially in several volumes between 1968 and 1972, and translated in English in 2013. The closely researched story spans the decade from the Sino-Japanese War to the Russo-Japanese War and went on to become the nation's favourite book. ^ a b Gordon, Andrew (20 July 2014). "Social Prot est in Imperial Japan: The Hibiya Riot of 1905". The Asia-Pacific Journal. 12 (29/3). Retrieved 20 January 2017. ^ Palasz-Rutkowska, Ewa (2000). "Major Fukushima Yasumasa and his Influence on the Japanese Perception of Poland at the Turn of the Century". In Edström, Bert (ed.). The Japanese and Europe: Images and Perceptions. Japan Library. pp. 126–33. ISBN 1-873410-86-7. ^ Ito, Eishiro (December 2007). "United States of Asia, James Joyce and Japan". In Brown, Richard (ed.). A Companion to James Joyce. Blackwell. pp. 195–6. ISBN 978-140511044-0. ^ a b Hunter, Jane (1993). "The Limits of Financial Power: Japanese Foreign Borrowing and the Russo-Japanese War". In Hamish Ion, A.; Errington, E.J. (eds.). Great Powers and Little Wars: The Limits of Power. Westport, CT: Praeger. pp. 146, 151–2. ISBN 978-0-275-93965-6. Retrieved 11 January 2018. ^ Jane H. Oakley (1905). A Russo-Japanese War Poem. Brighton: The Standard Press. ^ Upward, Allen (1904). The International Spy - Being the secret history of the Russo-Japanese War. M.A. Donohue & Co.
Chapman, John W. M. (2004). "Russia, Germany and the Anglo-Japanese Intelligence Collaboration, 1896–1906". In Erickson, Mark; Erickson, Ljubica (eds.). Russia War, Peace and Diplomacy. London: Weidenfeld & Nicolson. pp. 41–55. ISBN 0-297-84913-1. Jukes, Geoffrey (2002). 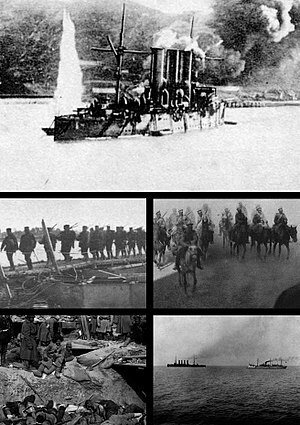 The Russo-Japanese War 1904–1905. Essential Histories. Wellingborough: Osprey Publishing. ISBN 978-1-84176-446-7. Walder, David (1974). The short victorious war: The Russo-Japanese Conflict, 1904-5. New York: Harper & Row. ISBN 0060145161. Warner, Denis; Warner, Peggy (1974). The Tide at Sunrise, A History of the Russo-Japanese War 1904–1905. New York City: Charterhouse. Kowner, Rotem (2007). The Impact of the Russo-Japanese War. Routledge. ISBN 0-415-54582-X. Google Map with battles of Russo-Japanese War and other important events.